Sea Trout are the migratory (sea-going) form of the Brown Trout (salmo trutta). The osmotic change as they migrate to a saline environment to feed causes the fish to turn silver in colour. They gradually loose this colouration and darken again in fresh water when they return to the river to spawn. 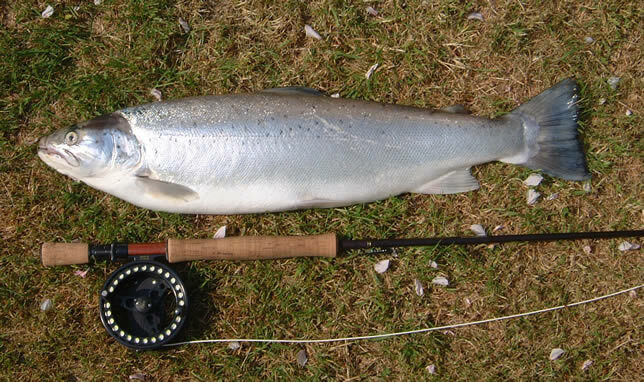 The sea trout – the westcountry peal, shoals of smaller school peal and the older spring run version with the nowadays little used name of truff. (It’s a new one on me! -Ed.) What are the prospects for fishing for these fascinating and frustrating fish? Totnes weir pool (highlighted in yellow on the map), for which one ticket for sea trout fishing at night is available. The Church Commissioners’ water (highlighted in green on the map) , for which two tickets per night are available. Additional water (red) is available to members. The larger fish tend to be those entering the river in the early part of the season. The Association record fish, an exceptional 17lbs plus, was taken in the 2007 season. The record fish for the river was also caught in the 2007 season and measured an amazing 42″, which must have rivaled the British record. Both fish were released unharmed. Most early fish are around the 2 – 4 lb mark however. Some of the juvenile fish that left the river to feed in early spring return as small ‘school peal’ later in the year. The Dart has not been immune to the slump in sea trout runs that has been seen nationally and this has been particularly the case in relation to school peal whose vast shoals used to carpet the river bed from late June to early September and produce large catches on suitable nights in the glorious setting of South Devon in its quietest summer hours. That having been said, there are still good numbers of fish available, with always the chance of a good fresh fish. As a conservation measure we now advise the release of fish, especially hens, of over 6lbs. In any case, the smaller fish make better eating! Otherwise the bag limit is two per night. The majority of the wading is safe but is more awkward on the left bank. Waders are essential as is warm and waterproof clothing – some May nights can approach freezing or be very wet. Visitors should also be aware that the weir pool can be very popular on some nights, so it is advisable to turn up before dark and introduce oneself to the members waiting to fish, who will be pleased to give advice on fishing the pool and local etiquette. It is advisable to have two outfits set up in advance and ready to use as various parts of the pool become or cease to be available, either by virtue of tide or other anglers. One outfit should be quite heavy: 10′ #7/8 rod, fast sinking line, 10lb leader, large flies. In the earlier part of the season aluminium tubes of up to 3″ prove successful on the sinking line. Try Alexandra ( the Dart fly), Stoat or Silver Stoat dressings or your own favourite. The other outfit can be lighter. A #6/7 9-10′ rod, intermediate or floating line, 7lb leader and smaller flies, size 8-6 or small plastic tubes. In addition to the above patterns try Mallard & Claret, Peter Ross or Teal, Blue & Silver. Some reservoir patterns will also take fish. 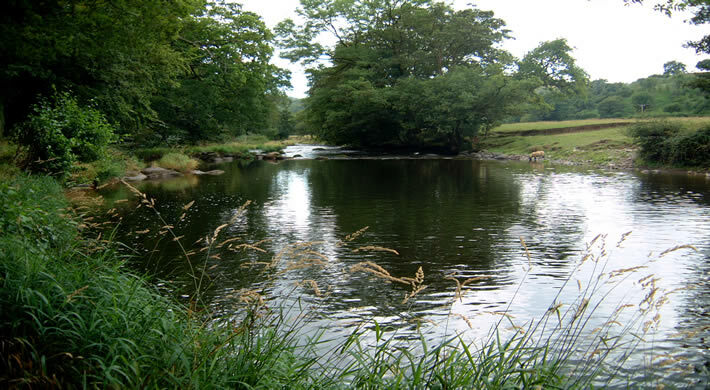 Generally speaking, up-river beats, including the Church Commissioners’ water, will be less busy than Totnes weir pool but even here pools near to access points and the opposite bank in some cases will be more popular and you may be better advised to fish some more distant pool until later in the night when some members will have departed. In all cases you should recce your intended pools in the daylight and carry a mobile phone and two torches when fishing. To turn up at an unknown stretch of the river in the dusk is to invite disaster! 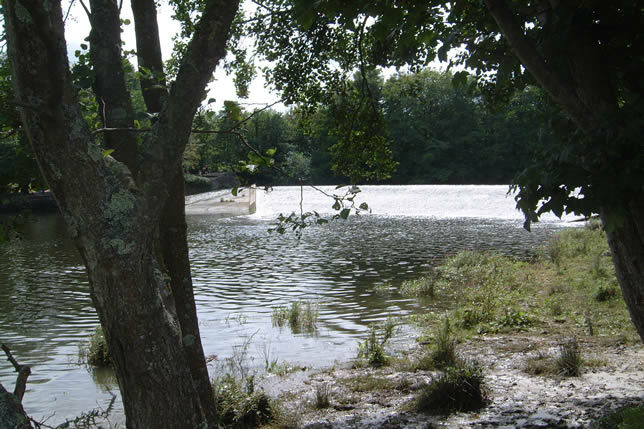 The lighter outfit mentioned in the section on Totnes weir pool will generally suffice for fishing further up-river, possibly using an intermediate line earlier in the season with higher water levels and a floater as the season progresses and levels fall. This set-up would also be suitable for fishing by day in high and/or coloured water, when peal can be encountered on occasions. In addition to the fly patterns mentioned in the previous section, surface lures or muddlers are sometimes effective. The muddler can be fished on a dropper, with a conventional fly on point. The following footage is an extract from a video made by DAA members a few years ago to introduce new members to the Dart. Due to the hydro scheme being installed at Totnes weir pool, the nature of the pool and the flows in it will no doubt change so the stands described by David Grove in the first part of this footage will perhaps become more of historical interest in the near future.